Have you wished that you could use NEHGS library resources from home? Have you wondered where to find copies of genealogies online? You can do this by starting with the NEHGS library catalog. Staff and dedicated volunteers have been working to add links to freely available e-books as well as to genealogies and items from our manuscript and book collections for members to use. 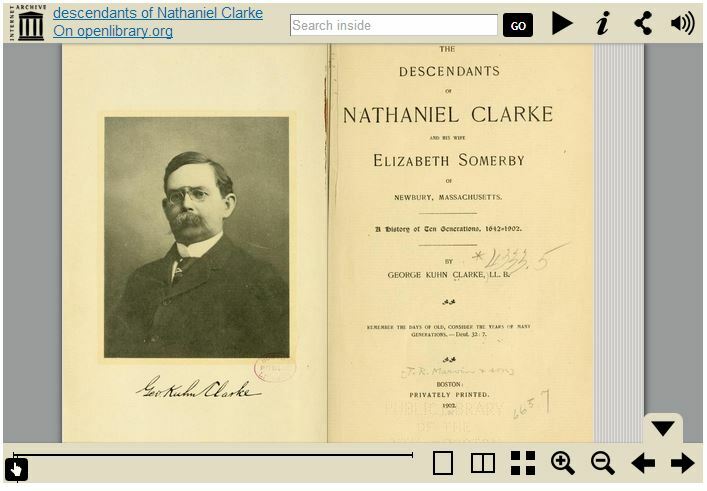 Searching for the Clark family retrieves The descendants of Nathaniel Clarke and his wife Elizabeth Somerby, of Newbury, Massachusetts, with a link to the book in the Internet Archive. The Internet Archive, along with Hathi Trust Digital Library, Google Book, and FamilySearch Books, is a great place to search for online books published before 1923. Now out of copyright, these books are available for use without restrictions. Links to newer material are also available through our catalog. Genealogy of the family of Miller of England, Massachusetts, Connecticut, Vermont, New Hampshire and Iowa by Larry M. Wilson (1995) has a link to Open Library where you can “borrow” the book by signing up for an account. Use of these newer books is limited to one user at a time, and the loan period is two weeks. If you are an NEHGS member, there are even more resources available for you to use from home. Search again for the Clark family, and by logging into the library catalog as a member you can access pages from the Bible record for the Joseph Clark family, 1802-1920, a guide to the Clark family papers at the New England Historic Genealogical Society (the manuscript collection itself, which is not digitized, is only available for use in the library), and a link to the NEHGS database Haring-Herring, Clark, Denton, White, Griggs, Judd, and Related Families. 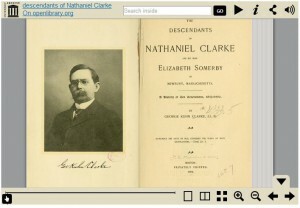 In addition, as a member you can be informed of new items added to the NEHGS collection in your field of interest by setting up a preferred search for weekly notification of anything new – http://library.nehgs.org/screens/help_preferred_search.html. While nothing beats an in-person visit to the society, we know you can’t always do that, so we are always searching for ways to deliver our collections and services to you at a distance. That is just great. Thank you for doing so much for those of us older, amateur genealogists who live thousands of miles away. LOVE YOU! You may have given me the clues needed to solve a long time brick wall. Thanks! As a non-member, what can I acess online using NEHGS? What I really want to know is, could I acess the full catalogue? Linda, thank you for your question. Anyone is welcome to search the NEHGS library catalog for free and without logging in. The part that is available only to members is most of the items in the Digital Library and Archive (which can be browsed here: http://library.nehgs.org/ftlist). Please let us know if you have any other questions.